Some zombie fans simply can't wait for Anna and the Apocalypse to hit theater screens. This particular subset of undead lovers also happen to be huge musical aficionados, and absolutely adore Christmas and holiday movies. Hey, it's not often that all of these genres collide in one big colorful explosion of death, gore and exuberantly cheery numbers. Today, we have an idea of what that looks like. "Stay tuned for the first single release and music video from the film, debuting tomorrow!" Interscope Records released 'Hollywood Ending', which comes from the official soundtrack to Orion Pictures' Anna and the Apocalypse via all digital partners. This video arrives with news that the cast will perform at the 4th annual Elsie Fest today, Sunday, October 7, at Central Park's Summerstage in New York City. This is sure to get zombie lovers pumped for the impending holiday season. Elsie Fest is a one-day outdoor music festival that celebrates the stars and songs from the stage and screen. Interscope Records releases "Hollywood Ending", the first song from the official soundtrack which will have your toes tapping in no time. 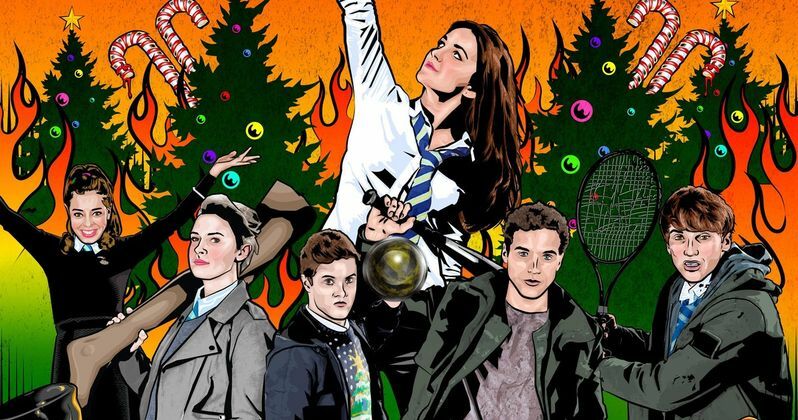 Anna and The Apocalypse follows Anna (Ella Hunt), whose life is dominated by the typical concerns of her youthful peers until the Christmas season in her small British town brings not Santa but an outbreak of the Undead. A zombie apocalypse threatens the sleepy town, forcing Anna and her high school friends to fight, sing, and slash their way to survival with a fast-spreading undead horde in relentless pursuit. Anna and the Apocalypse is based on the 2010 BAFTA winning short film Zombie Musical; directed by John McPhail (Where Do We Go From Here); written by Alan McDonaldand the late Ryan McHenry (Ryan Gosling Won't Eat His Cereal viral series); with original music by Roddy Hartand Tommy Reilly, a film and TV songwriting partnership from Glasgow, Scotland, who have each released several critically acclaimed solo albums.